§1. As I re-read “Origins of the goddess Ariadne,” written in 1970 by Robert T. Teske and republished forty-eight years later in 2018 by the Center for Hellenic Studies, http://nrs.harvard.edu/urn-3:hul.ebook:CHS_TeskeR.The_Origins_of_the_Goddess_Ariadne.1970, I marvel at the elegant beauty of it all. His bibliography is out of date, but, somehow, the freezing of time going back to forty-eight years ago, when he completed his original study of Ariadne, makes his achievement seem to me all the more timeless right now. What grips me especially, all these years after Bob finished writing his original work, is the intuitiveness of his discovery procedures. Unlike all too many classicists, Bob has a deep understanding of variation in ancient Greek myths and rituals. Instead of trying to flatten out the differences among the many surviving traditions centering on the figure of Ariadne, he most deftly brings out the labyrinthine complexity of this ‘very holy’ figure—which, as we will see, is what her name actually means—by tracking the mass of mutually contradictory details that the ancient world has preserved about her. §2. Over the last few years, I too have been tracking—though not as thoroughly as Bob Teske—the varied traditions about Ariadne, and I offer here, as a tribute to his original work of 1970, some supplementary observations—which are keyed to a bibliographical inventory of some relevant publications of mine as listed underneath the paragraphs that follow. Detail from a fresco found at Hagia Triadha in Crete. Reconstruction by Mark Cameron, p. 96 of the catalogue Fresco: A Passport into the Past. Minoan Crete through the eyes of Mark Cameron. 1999. Catalogue curated by Doniert Evely. Athens: British School at Athens; and N. P. Goulandris Foundation, Museum of Cycladic Art. Reproduced with the permission of the British School at Athens. BSA Archive: Mark Cameron Personal Papers: CAM 1. §3. I start with an epitome of comments I made in one of those publications listed below, N 2016–2017 (here and hereafter, I abbreviate my name as “N”). The comments had to do with Iliad 18.590–606. This Homeric passage makes reference to a most salient feature of Ariadne: as we read at Iliad 18.590–592, she is imagined here as dancing within a labyrinthine space made for her by the master craftsman Daedalus. The picture that I show above this paragraph is to my mind a most telling visual approximation of such a dancing Ariadne. As we read further at Iliad 18.590–592, the making of this dancing space for Ariadne had been commissioned by Minos, her father. This Minos, as we see from other Homeric references—and from the overall testimony of ancient Greek myths—was once upon a time the king of Knossos in Crete, and he dominated the Aegean Sea as the mighty ruler of the prototypical Minoan Empire. From the wording of Iliad 18.590, we see that the princess Ariadne, daughter of Minos, would be dancing in a khoros—a word that meant ‘group of dancers-and-singers’ and, earlier, ‘place for dancing-and-singing’. This place for dancing-and-singing, as we read further at Iliad 18.590–592, had been made for the princess by the human artisan Daedalus—but such an ancient choral setting is then compared at Iliad 18.590 / 593–606 to a newer choral setting that is being made by the divine artisan Hephaistos in the act of creating a new Shield for Achilles. And this newer choral setting, as made by Hephaistos, evokes a stylized performance of Homeric poetry, as I argue at length in Chapter 4 of my book Masterpieces of Metonymy (N 2015). In other words, what happens at Iliad 18.590–606 is that Homeric poetry itself compares its own context of performance, which is stylized as a choral scene figured by the divine artisan Hephaistos, to an earlier choral scene that had once upon a time been figured by the prototypical human artisan Daedalus for the choral dancing-and-singing of Ariadne herself in the Bronze Age of Minos. §4. As I argue further in Chapter 4 of the book Masterpieces of Metonymy, a close reading of Iliad 18.590–606 leaves us with a most uncanny impression. It is as if the choral setting created by Daedalus the human could be seen as some kind of a prefiguration of the Homeric setting that is supposedly being created by Hephaistos the god. But such an impression is an artistic illusion. The god is of course timeless, and his metalwork is an art that must be synchronized with the art of Homer in refiguring what Hephaistos is figuring. For the sake of enhancing the verbal art that refigures the visual art of Hephaistos, the visual art of Daedalus can be envisioned as a precedent. And this art of Daedalus is a most prestigious precedent for Homeric poetry, which in its own right goes back all the way to the Bronze Age. Moreover, the synchronization of the god’s art with Homeric art makes it possible for the god’s art of metalworking to be versatile enough to be comparable to still other prestigious forms of art. A shining example is the Homeric use of poikillein ‘pattern-weave’ at Iliad 18.590 in referring to the metalwork of Hephaistos in figuring the festive scene. §5. Another most significant Homeric reference to Ariadne, although this one is indirect, can be found at Odyssey 15.1–9, as I argue in N 2017.04.11 (5§§29–31). What follows in the rest of this paragraph is an epitome. In the Homeric Odyssey, the Minoan-Mycenaean world is linked more directly to Sparta than to Crete. To make this point, I concentrate on the beginning of Odyssey 15, where the goddess Athena appears in an epiphany to Telemachus at Sparta. As Athena tells Telemachus at 15.1–9, it is time for the young hero to conclude his visit at Sparta and to go back home to Ithaca. I highlight the fact that Sparta is described here at O.15.001 as eurukhoros (εἰς εὐρύχορον Λακεδαίμονα), meaning ‘having a wide dancing-place’. I see here a Minoan-Mycenaean signature. Relevant is the word Kallikhoron, which is explained this way in the dictionary of Hesychius: Καλλίχορον· ἐν Κνωσσῷ ἐπὶ τῷ τῆς Ἀριάδνης τόπῳ ‘Kallikhoron was the name of the place of Ariadne in Knossos’. And the meaning of this ‘place of Ariadne’, Kallikhoron, is ‘the dancing-place that is beautiful’. It is most relevant to review here the fact that the word khoros can designate either the ‘place’ where dancing-singing takes place or the group of dancers-singers who perform at that place. Such a beautiful place, as we already saw in Iliad 18.590–606, is made visible by the divine smith Hephaistos when he creates the ultimate masterpiece of visual art, the Shield of Achilles. At I.18.593–606, we saw in action the dancing—and singing—that happens in the picturing of the divine place, the word for which is khoros, I.18.590. And the prima donna for such dancing-and-singing was visualized as the girl Ariadne, Iliad 18.592, for whom Daedalus had made the ultimate place for dance and song. §6. In N 2015.09.17, I sketched what can be reconstructed as a Minoan-Mycenaean version of Ariadne. Then, in N 2015.09.24, I turned to later versions, as reflected especially in the visual arts of the sixth and fifth centuries BCE. 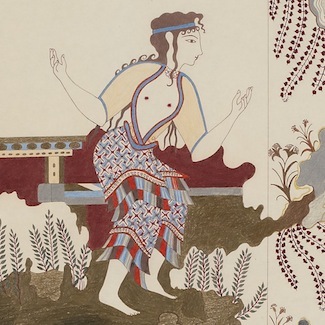 In these later versions, we can see more clearly the connectedness of Ariadne with the idea of thalassocracy—an idea inherited from Minoan-Mycenaean civilization. According to an epitomized narrative derived from Epimenides of Crete (FGH 457 F 19 = DK 3 B 25), Ariadne had a garland, given to her as a gift by the god Dionysus, who intended to seduce her. In N 2015.09.24 (§3) and elsewhere (as in N 2013:157), I had translated phtheirai as ‘to destroy’, but I now see that it would have been better to render this verb here as ‘seduce’, since the epitomized narrative goes on to say that Ariadne had been ‘deceived’ (ēpatēthē) by the gift, while Theseus was saved (sōthēnai) by the same gift, since the garland of Ariadne radiated for him a mystical light that helped him escape from the labyrinth. After Theseus and Ariadne eloped to the island of Naxos, as I go on to recapitulate the myth in N 2015.09.24, the mystical garland was turned into a constellation. By implication, the deception of Ariadne by way of the garland given to her by Dionysus is correlated with the salvation of Theseus by way of that same garland. By further implication, Ariadne had to die at Naxos, and what compensates for this death is the miraculous exaltation of her garland, which now becomes a constellation in the heavens. §7. In N 2015.07.15 and in N 2015.09.24 (§10) I draw attention to a relevant detail that we read in Poem 64 of Catullus, which mediates earlier Greek sources. This detail is synchronized with the moment when Ariadne discovers that she has been abandoned by her lover Theseus, lines 60–67. The poem pictures her standing helplessly on the island shore, looking out toward the sea, when, all of a sudden, her hair comes undone as she sees the ship of her lover sailing away. At this moment, her beautiful head of hair or vertex, which is pointedly described as blond or flavus, line 63, comes undone. Here I epitomize what I go on to say in N 2015.09.24 (§11). At the very moment when Ariadne comes emotionally undone here, her hairdo likewise comes undone, and so too all her clothing comes undone. Now she looks like a perfect Maenad, that is, like a woman possessed by the Bacchic frenzy of the god Dionysus. It is the maenadic looks of Ariadne that attract Dionysus to her from afar, and, as we read in Catullus 64.253, the god is inflamed with passion for the princess as he now hastens toward her. §8. What follows is a torrid sexual encounter of Ariadne with Dionysus. In this context, it seems, there is a garland given to her by the loving god to adorn her flowing hair, but this adornment cannot save Ariadne from death inflicted by the goddess Artemis. And, once she dies, the garland of the dead girl is now subsumed into the heavens, transformed there into a celestial crown of stars. Ariadne (1803/1804), by Jean-Baptistie Greuze (French, 1725–1805). Image via. §9. Myths about the killing of Ariadne by Artemis highlight the dead girl’s identity as a female hero. But they also highlight, as Robert Teske has argued, her earlier identity as a female divinity who has been superseded, already in prehistoric times, by another female divinity, the immortal goddess Artemis. And it is this kind of a supersession that inspires the title of Teske’s work, “Origins of the goddess Ariadne.” Her name, Ariadnē, meaning ‘very holy’ (4§7 in N 2017.04.11), is an epithet that corresponds to the common appellation hagnē ‘holy’ of the goddess Artemis in historical times. The girl who dies in the name of Artemis, as it were, can now become the signifier of virginal immortality for Artemis herself. There is a comparable death for a girl named Kallistō. As we read in Pausanias 8.3.6 and elsewhere, this Kallistō was killed by Artemis; and, as we read further in Pausanias 8.35.8, there was in Arcadia a mound of earth marking where Kallistō was thought to be buried, on top of which was a precinct sacred to the goddess Artemis, who was known in this context by way of a common epithet of hers, kallistē, meaning ‘most beautiful’. Here, then, the girl’s death in the name of Artemis becomes a signifier for the immortal identity of the goddess as ‘most beautiful’. Similarly, as I argue in Chapter 4 of the book Masterpieces of Metonymy, a parthénos or ‘girl’ who dies for Athens in the name of Athena becomes a signifier for the immortal identity of Athena Parthénos residing in the Parthenon on top of the acropolis in Athens. Nagy, G. 2013. “Virgil’s verse invitus, regina … and its poetic antecedents.” More modoque: Die Wurzeln der europäischen Kultur und deren Rezeption im Orient und Okzident. Festschrift für Miklós Maróth zum siebzigsten Geburtstag (ed. P. Fodor, Gy. Mayer, M. Monostori, K. Szovák, L. Takács) 155–165. Budapest. http://nrs.harvard.edu/urn-3:hlnc.essay:Nagy.Virgils_Verse_Invitus_Regina.2013. —. 2015. Masterpieces of Metonymy: From Ancient Greek Times to Now. Hellenic Studies 72. Cambridge, MA, and Washington, DC. http://nrs.harvard.edu/urn-3:hul.ebook:CHS_Nagy.Masterpieces_of_Metonymy.2015. —. 2015.07.15. “Classical variations on a story about an Egyptian queen in love.” Classical Inquiries. https://classical-inquiries.chs.harvard.edu/classical-variations-on-a-story-about-an-egyptian-queen-in-love/. —. 2015.09.10. “From Athens to Crete and Back.” Classical Inquiries. http://classical-inquiries.chs.harvard.edu/from-athens-to-crete-and-back/. —. 2015.09.17. “A Cretan Odyssey, Part 1.” Classical Inquiries. https://classical-inquiries.chs.harvard.edu/a-cretan-odyssey-part-1/. —. 2015.09.24. “A Cretan Odyssey, Part 2.” Classical Inquiries. http://classical-inquiries.chs.harvard.edu/a-cretan-odyssey-part-2/. —. 2016–2017. A Sampling of Comments on the Iliad and Odyssey. http://nrs.harvard.edu/urn-3:hlnc.essay:Nagy.A_Sampling_of_Comments_on_the_Iliad_and_Odyssey.2017. —. 2017.04.11. “Diachronic Homer and a Cretan Odyssey.” Short Writings IV. http://nrs.harvard.edu/urn-3:hlnc.essay:Nagy.Diachronic_Homer_and_a_Cretan_Odyssey.2017.